There are many misconceptions about the Staffing Industry. In this day and age of free-flowing information (and misinformation) that can be said about almost every industry. Your Employment Solutions has worked to become Utah's best choice for staffing since 1995. A big part of what makes us the best in our industry is our commitment to being honest and open in business. This policy is ingrained in the organization from the examples of YES's leaders Reed Laws and Kerry Westenskow. Continuing in that spirit of honesty and transparency, here is the second in a series of blog posts meant to clear up any staffing myths you might have. If you've ever considered working with a staffing agency, but were unsure about it for any reason, my hope is that these posts resolve any of your questions. Do staffing agencies only hire for low-paying entry-level jobs? Staffing agencies hire for a variety of jobs, at different levels on the career ladder, and throughout multiple industries. Many of the jobs are entry-level, as those jobs are generally the types that see the most turnover. But staffing agencies also recruit for a large number of mid-level and upper-lever jobs as well. Why am I only offered an entry-level job? It may depend on your experience. If a jobseeker is new to the workforce, the jobs available will likely be equal to the experience that a new worker brings. In other words, entry-level and lesser pay. But there are plenty of jobs available through employment staffing agencies for jobs seekers with experience as well. Staffing companies want to supply the best qualified candidate for the jobs. Wages will be competitively designed to attract the quality required. How much can you make working at a staffing agency? Anywhere from minimum wage to well over 6-figures a year. The amount you earn depends on the level of the job and the quality of your skills and experience. Check out this blog post to find out more about what your paycheck might look like working through a staffing agency. I hope this post helped answer any questions you might have regarding pay in staffing or at least cleared up some of the more common myths. 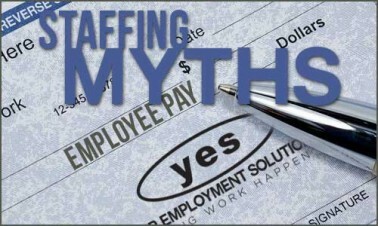 Other staffing myths posts in this series cover the topics of employee fees, types of jobs in staffing, resumes, and more. If I missed anything you'd like to know about, please leave a comment and let me know!